"More Nazi than the Nazis"
We’ve criticized the New York Times frequently enough on this site for its readiness to soft-pedal the evils of Communism, to sentimentalize the enduring devotion of aging Stalinists, and to assert that in some ways the ideology that gave us the Gulag, the Killing Fields, and the Cultural Revolution was, quite simply, preferable to our own. But we have to give credit where it’s due, and the Times did deserve a thumbs-up when, in April of last year, it ran a piece by Alexandra Stevenson about the ominous way in which the Chinese Communist Party is asserting its power over international firms doing business within its borders. Even more ominous is the alacrity with which the firms are knuckling under. Stevenson provided some specifics: “Honda, the Japanese automaker, changed its legal documents to give the party a say in how its Chinese factories are run.” When Cummins, an engine manufacturer based in Indiana, named a new manager for one of its Chinese subsidiaries, Beijing put the kibosh on the appointment, and Cummins obediently agreed to new “articles of association” with the Communist state. Since Stevenson’s article appeared, things seem to have gone from bad to worse. At least that’s the impression one gets from a recent Associated Pressstory about Kentucky Fried Chicken (KFC). On March 5, according to the report, the fried-chicken empire opened a new restaurant in the city of Changsha in the province of Hunan that is specifically dedicated to the memory of its local hero, Lei Feng. The date of the KFC branch opening was no coincidence: in China, March 5 is Lei Feng Day. It sounds fatalistic – as if Moon’s “nightmare” were foreordained. In fact, as Kang goes on to explain, Moon would appear to have surrounded himself with a bunch of crooks. There are so many of them that it can be hard to keep track of them all. One of them is legislator Sohn Hye-won, who is suspected of covert involvement in the purchase of properties that were later officially designated as cultural assets, thus automatically enhancing their values. In late January, in a bizarre effort to prove her innocence, she offered to donate her collection of lacquerware to the government. Another of Moon’s party hacks is legislator Seo Young-kyo, who purportedly asked a judge to reduce the punishment for a crony’s son accused of attempted sexual abuse. Yet another member of the party, Moon’s economic advisor Kim Hyun-chul, resigned on January 29 over some remarks about South Korean retirees and allies that were deemed offensive. Then there’s Moon’s daughter, Moon Da-hye, who recently moved out of the country with her husband and children, the supposed reason for which was that her husband had embezzled $2.7 million of a government subsidy received by his employer and left the country to protect his assets from seizure. Finally, there’s Kim Kyung-soo, governor of the South Gyeongsang province and a former Moon campaign aide, who was sentenced on January 30 to two years behind bars for helping to rig an opinion survey. As a result of all this, Moon’s approval rating has dropped from a high of over 70 percent to below 50 percent. In a January 22 piece for the East Asia Forum, Kim Kee-seok, a political scientist at Kangwon National University, was even blunter than Kang. Whereas Kang’s headline ended in a question mark, Kim’s made a firm statement: “Moon’s popularity wanes as South Korea’s economy stalls.” As the headline indicates, Kim, unlike Kang, cited the nation’s faltering economy as a reason for Moon’s declining fortunes. Kim also mentioned the failure of the North Korea peace initiative to bear any fruit thus far. But Kim, like Kang, also focused on corruption. Whereas Kang itemized the sleazy presidential sidekicks and family members who are dropping like flies, Kim attended not to these specifics but to the general issue of reform. As Kim put it, South Korean voters who “demanded fundamental innovation of the political system,” including changes in the constitution, electoral process, and judicial system, become “sceptical of the prospects for innovations of this kind as the Moon administration continues to lose golden time.” We could hardly put it better ourselves. In 2017, Moon Jae-in made big promises to an electorate that’s increasingly sick of routine corruption at the highest levels of politics and business – and he’s utterly failed to deliver on them. This would all make an interesting movie – full of colorful characters, intense conflict, mounting tension, and stunning reversals – except for the fact that it’s all just too sprawling a story, with too many villains and, so far, no hero. What are we talking about here? We’re talking about the large-scale corruption at the uppermost levels of the South Korean government and business sector that, in the last couple of years, has made for some high drama, complete with palace intrigue, smoking guns, and courtroom clashes. What is required here is a screenwriter who can tame this tale and foreground a single arresting plot line. But what to foreground? OK, take a deep breath, here goes: in the brief period since 2017, we’ve seen the removal from office – and long-term imprisonment – of South Korea’s first female president (Park Geun-hye) after she was caught doing underhanded deals, through her shady best friend (Choi Soon-sil), with top business leaders – who, as usual, went scot-free – and her replacement by a self-styled “reform” president (Moon Jae-in), who, making bold promises to rein in the power and corruption of the increasingly unpopular chaebols – those massive, family-run conglomerates that dominate that nation’s economy and that operate with impunity – installed an antitrust czar (Kim Sang-jo), widely styled the “chaebol sniper,” who started off his three-year term with a lot of tough rhetoric about cutting Samsung, Hyundai, and other chaebols down to size, only to tone down his language in recent months and talk, instead, in pathetically humble language, about requesting modest alterations in the chaebols’ organizational charts, even as the president himself began getting all chummy with the chaebol leaders, apparently having decided that he needed them on his side if he wanted to kick his country’s weak economy back into high gear. Phew. So does that mean we’re back at square one? Not exactly. Because, as we’ve mentioned before, while President Moon and his “sniper” seem to have dwindled into impotence and irrelevance, the cause has been taken up by some of the people who actually own sizable chunks of the chaebols but who, in keeping with the curious (indeed, unique) traditions of the chaebols, have been systematically denied any meaningful input into the governance of the conglomerates. The bizarre fact, which remains unchanged, is that in most cases, the families that founded the chaebols and that still hold the key leadership positions in them don’t own a majority or even a plurality of shares in those firms. Indeed, some of the chaebol royal families would, under ordinary Western circumstances, be considered negligible minority stockholders. No surprise, then, that as the South Korean economy falters and the chaebols, immense though they are, look more and more as if their best years are behind them, investors – most of them foreigners, many of them Americans – who have plunged large sums of money into the chaebols are increasingly frustrated at their own lack of power to initiate significant changes. The unfortunate truth is that while the men who founded the chaebols were business wizards, their children and grandchildren, who now sit behind the big desks in the corner offices, don’t necessarily have what it takes to run some of the world’s largest corporations. Meanwhile, many of those investors have proven track records at turning failing businesses around – at spinning off or closing down certain subsidiaries, at recognizing the need to hire or fire certain executives, and at successfully restructuring extraordinarily diversified conglomerates to maximize efficiency and profits. So it is that, as Kim Jaewon of Nikkei reported on January 21, Korea Corporate Governance Improvement (KCGI), a newly founded South Korean activist fund that is now the second largest shareholder in the Hanjin Group (whose most famous holding is Korean Air), is pushing it to sell its hotel chain, which includes the Wilshire Grand Hotel in L.A. and the Waikiki Resort Hotel in Hawaii, and to form an independent committee that would select Hanjin’s CEO and other top leaders. Now that would be real reform – a change in policy that would actually make it possible to remove from office the scarifyingly rich and corrupt members of one of the chaebol royal families – in this case, the notorious Cho clan, which owns 29% of Hanjin – and replace them with new, competent, and even (could it be?) clean outsiders. Such a transformation would mean the departure of company chairman Cho Yang-ho, who last year was indicted on embezzlement charges; of his wife, who has been probed for smuggling; of his daughter Cho Hyun-min, who was accused of assaulting an ad-agency executive; and of another daughter, Cho Hyun Ah, whose outrage at a flight attendant who served her macadamias in a bag and not on a plate led to a scandal and a legal mess that made headlines worldwide. In short, it’s a family that Hanjin, and South Korea generally, would be much better off without. Bottom line: the protagonists in this drama may turn out, in the end, to be these so-called activist investors. Screenwriters, stay tuned. Now here’s a new twist. As we’ve recounted in some detail on this site, South Korea is going through a rough patch, economically speaking. In the decades after the Korean War, the country grew with remarkable rapidity from an undeveloped backwater into an international powerhouse. Leading this spectacular advance was a relative handful of family-run conglomerates, known as chaebols (the plural in English is often rendered as “chaebol”), whose names – Samsung, Hyundai, etc. – have become famous around the world. For decades, the chaebols were the engines of the South Korean economy. The nation’s populace looked up to them. The dearest hope of South Korean parents was that their kids would someday go to work for one of the chaebols. In recent years, however, there has been a discernible shift in public attitudes toward the chaebols. For one thing, they’ve increasingly been seen as crowding out new businesses and thus stifling both competition and innovation – thereby making it hard for the South Korean economy to grow even further. For another thing, as ordinary South Korean citizens have grown more and more accustomed to the idea of democracy and equal treatment under the law, they’ve also grown tired of the shameless double standards that have allowed the chaebol dynasties to get away with corruption on a massive scale. When Moon Jae-in became president in 2017, he promised to clean up the chaebols. Other presidents before him had made the same promise – among them his immediate predecessor, Park Geun-hye, who is now in prison because of illegal transactions with chaebol kingpins. 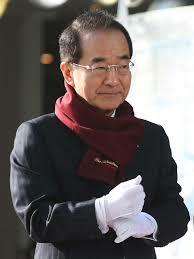 But Moon insisted he really intended to tackle chaebol corruption. To prove it, he put the nation’s Fair Trade Commission in the hands of a fellow named Kim Sang-jo, who called himself the “chaebol sniper.” One gathered that President Moon had put the toughest guy he could find on the job – a sort of cross between Clint Eastwood’s Dirty Harry and the Charles Bronson character in Death Wish. A fella who would make the bigwigs at Hyundai and Samsung tremble in their office towers and give them nightmares in their lavish mansions. True enough. Funny it took him so long to say so. Everybody else already had. Kim went on to suggest that the people who have inherited their positions of power at the chaebols need to step down – or at least step away – from their posts, perhaps exchanging the title of CEO for that of Chairman, and choosing to concentrate on long-term strategy while allowing professional managers to make day-to-day decisions. It doesn’t sound like a bad idea, at least to start with. But is Kim going to use his power to pressure the chaebol dynasties to do this? Or was this simply meant to be a modest suggestion from a man who, with every major media exposure, seems more and more determined to project a modest image? Apparently the latter. For Kim then went on to say: “If you thought I am a chaebol killer, you misunderstood me. The only way to succeed in chaebol reform is to make it predictable and sustainable.” Meaning what? Well, one’s first reaction is that this comment seems to have been formulated in such a way as to mean just about anything to just about anybody. It’s not a policy statement but a political slogan, every bit as empty and meaningless as “hope and change” or “stronger together.” No wonder both Moon and Kim are plunging in the polls. The current chapter in the history of the chaebols continues to develop in exceedingly interesting ways. As we have been discussing on a regular basis at this site in recent weeks, these massive, heavily diversified, internationally famous, and family-run conglomerates – which have dominated the South Korean economy since shortly after the Korean War, raising the nation up from indigence to prosperity even as its government moved gradually closer to real democracy – have hit on challenging times. Once engines of growth, the chaebols are now barriers to further growth, so large and powerful that they’re capable of crushing, with little effort, the development of new firms and stifling the spirit of entrepreneurship. As a result, in South Korea there is hardly any way to make a respectable career in business other than to find a job at one of the chaebols. And however talented and motivated one may be, there is no way to rise to the very top of one of the chaebols unless one happens to have been born into the right family. This state of affairs has led to growing resentment toward the chaebols – a resentment intensified by the corrupt ties between the chaebol dynasties and the country’s political elites, and, perhaps most bizarre of all, by the fact that the people who hold tight to the reins of power in these conglomerates are not necessarily the same people who own the lion’s share of their stock. On the contrary, it is rare indeed for the stockholders in the chaebols to have much say at all in their actual management. As we’ve discussed here, and as Kim Jaewon noted in a recent article for Nikkei, South Korean Moon Jae-in, upon his inauguration in May 2017, promised major chaebol reform. To be sure, it is a tradition for newly installed South Korean presidents to vow chaebol reform. But Moon spoke so insistently about the matter that he persuaded a good many citizens of his country that he really meant to do something. As the weeks and months have gone by since he took power, however, fewer and fewer have looked upon his assurances with confidence; and, as the usual arrests for corruption have taken place, followed by the usual pardons for the chaebol executives involved and the usual prison terms for the politicians, once again cynicism about the chaebols has been on the upswing. Yes, they are royal families. There’s nothing quite like them anywhere else in the world. The clans that run the South Korean chaebols – the relatively small number of sprawling, internationally famous conglomerates that have dominated that country’s economy since not long after the Korean War – have long been viewed as royal families. The top executive positions at these companies pass down from generation to generation; the men (they are almost invariably men) who hold these offices wield enormous power over the nation’s political class; and the sons and daughters of these bosses are celebrities, whose social lives are followed closely in the popular media, and who are often, indeed, described as princes and princesses. One thing that these chaebol families have in common with actual royal dynasties is the high level of intermarriage between them. According to a new survey, 49.3% members of the founding generation of the chaebol clans – the people who actually established these firms in the second half of the last century – are or were married to spouses who also belonged to families that founded chaebols. Among members of the second generation of chaebol ruling families,the figure is even higher: 52.7% of the people whose parents founded chaebols married other people who parents also founded chaebols. In South Korea, just as the management of chaebols is almost universally dynastic matter, politics is also very often a family game. Former President Park Geun-hye, for instance, who is currently behind bars because of her involvement in chaebol corruption, is the daughter of former President Park Chung-hee. Many chaebol family members who do not marry into other chaebol families have, instead, married into powerful political families, which both reflects and reinforces the intimate ties that bind chaebol CEOs and Chairmen to officials at the highest level of the South Korean government. Among members of the first generation of chaebols, 23.4% were or are married to members of “powerful” political families; in the second generation, this figure declined to 7.4%. The survey produced some other interesting findings. Of all the chaebols, the GS Group, had the highest number of “in-law relations” with other chaebols, namely seven. GS, like most of these conglomerates, is highly diversified, although in its case there is a particular emphasis on oil, gas, and other energy-related products. The second chaebol on the list, with six “in-law relations,” was the LS Group, which manufactures power cables, electrical equipment, machinery, and other such products. Why does any of this matter? Because these statistics serve to reinforce the perception, on the part of many ordinary South Koreans, that their country – in which democracy has, admittedly, made great strides over the last several decades – is still, to a deplorable extent, governed by a network of business and political kingpins, people who are tied to one another not only by shared financial interests and systematic corruption but, yes, by the most intimate of family bonds. Finally: street protests against chaebol corruption! On this site we’ve been reporting for some time on the lavish vows by South Korean President Moon Jae-in to reform the chaebols, those massive family-run conglomerates that have served as the foundation of that country’s economy since not long after the Korean War – and that have increasingly been viewed with disfavor by that country’s citizens because of their extraordinary levels of corruption, nepotism, and impunity, not to mention their power to choke potential competitors in the cradle. We’ve introduced our readers to Kim Sang-jo, not exactly intimidating man who was supposedly delegated by Moon with the task of challenging chaebol corruption and who, laughably, calls himself the “chaebol sniper.” And we’ve discussed the chaebol shareholders who, after years of biting their tongues, are finally starting to rebel against the bizarre system whereby clans that own only a small percentage of their companies nonetheless rule them with an iron hand. Now comes some encouraging news. On November 21, with the backing of the Korean Confederation of Trade Unions (KCTU), more than 150,000 South Korean workers walked out of factories at firms like Samsung and Hyundai in protest against the utter failure of Moon’s government to come across with the chaebol reforms he promised. The KCTU further noted that the chaebol kingpins Lee Jae-yong (Samsung) and Shin Dong-bin (Lotte) had recently been arrested, tried, and convicted of bribing former President Park Geun-hye (who left office in disgrace because of the scandal) only to be given suspended sentences. Such special treatment for chaebol top guns is a longstanding tradition in South Korean politics and jurisprudence, and one that is making the nation’s citizens increasingly restive. That November 21 protest, moreover, was only one part of a growing nationwide uprising against President Moon. Every weekend of late, South Koreans have poured into the streets of Seoul in huge numbers to express their rage over Moon’s failure to keep his pledges. Describing these demonstrations as “raucous,” the Financial Times noted that while President Park and another former president, Lee Myung-bak, have ended up behind bars for corruption, the chaebol masters who were involved in the same acts of corruption still seem to be above the law. According to FT, the probability that a chaebol boss convicted of corruption will get a suspended sentence exceeds 70% – while the comparable rate among non-chaebol leaders is 40%. As for poor schlubs who are found guilty of “street crimes,” such as petty theft, only 20% of them can expect to have their sentences suspended, even though the scale of their crimes is, of course, outrageously trivial compared to the monstrous malfeasances routinely committed by chaebol royalty. Chaebols: are the “ants” finally rebelling? We’ve written frequently at this site, of course, about those South Korean conglomerates – known as chaebols – that are notorious for their outsized power and corruption and for the perverse fact that the power is in the hands of families that own small percentages of these behemoths and not in the hands of shareholders. About time. To some of us, the passivity of chaebol shareholders has never made a great deal of sense. It can only be understood as a cultural thing, a sign of the near-reverence with which the chaebol families have long been regarded. After the Korean War, these families founded these companies, and these companies, in turn, raised South Korea up from an impoverished Third World land to an economic powerhouse. Hence the family patriarchs came to be viewed as virtual royalty. But no more. “Corporate shareholder meetings have stretched for more than a dozen hours,” wrote Cain and Kim, “as shareholders barrage CEOs with questions; others have stormed the microphone, only to be removed by security.” They quote one “ant’s” summing-up of the way South Koreans have been trained to think about these things: “Finance is like the written word of ancient times,” he said. “It is the privilege of the ruling class. It is the preserve of the elite.” Well, if these signs of revolt are portents of a new era, then that kind of old-fashioned deference to a handful of powerful clans may well be on the way out. Which, it has to be said, is a healthy sign for South Korean democracy. Another week, another stroll down memory lane. Chaebol memory lane, to be specific. In recent weeks we’ve been recounting the stories of various top-level executives of these massive South Korean conglomerates – men who, as is their wont, have ended up in hot water, and often in courtrooms (and, sometimes, at least briefly in prison cells) because of their corruption. To be sure, chaebol leaders who get caught with their hands in the till don’t always end up arrested or imprisoned or pardoned. The South Korean shame culture leads some of them to take their lives. You might wonder why, if the shame culture is a powerful enough psychological phenomenon to drive these people to suicide, it doesn’t keep them from bribing and embezzling and so on in the first place. But that question is perhaps beyond the scope of this blog. Here are a few examples of high-level South Korean self-slaughter. On August 4, 2003, Chung Mong-hun, the chairman of Hyundai and the son of its founder, jumped to his death from his 12th-floor office window. As the New York Times put it, Hyundai was South Korea’s “economic ambassador to the Communist North”; Chung had played a key role in arranging an historic summit in June 2000 between Kim Jong Il and South Korean president Kim Dae Jung. Afterward, however, South Korean auditors looked into the behind-the-scenes dealings relating to the summit and found that Chung had illegally paid a massive bribe to Pyongyang. He was about to be arrested for this crime when he chose to take the leap from his office window. Two years ago it was Lee In-won’s turn. Lee, the #2 man at the Lotte Group, which at the time was South Korea’s fifth largest conglomerate, when he was found dead in August 2016 beside a walking and cycling path near Seoul; he had hanged himself from a tree with his necktie. Lee, age 69, had spent 43 years at Lotte, where he was the highest ranking official not belonging to the conglomerate’s ruling Shin family. His suicide took place two months after police – tipped off about crooked deals among Lotte subsidiaries that led to the formation of a slush fund – raided the firm’s offices in search of evidence of those crooked deals. At the time of Lee’s suicide, he was scheduled to be grilled by prosecutors about these irregularities.